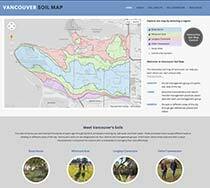 The Vancouver Soil Map is a web-based tool that provides unique learning opportunities on the topics of soil formation, urban agriculture, and soil types within an urban setting. The tool was designed with the intention of providing greater access to valuable information on agricultural land-use opportunities within the city of Vancouver. Users of the Vancouver Soil Map tool are able to determine the soil management group for any location within the Lower Mainland and learn about soil characteristics and recommended management practices associated with each soil management group with the help of educational videos and photos. Funding for this project was provided by the UBC’s Teaching and Learning Development Fund (2013).